Hey friends, I have another Altenew card to share with you. 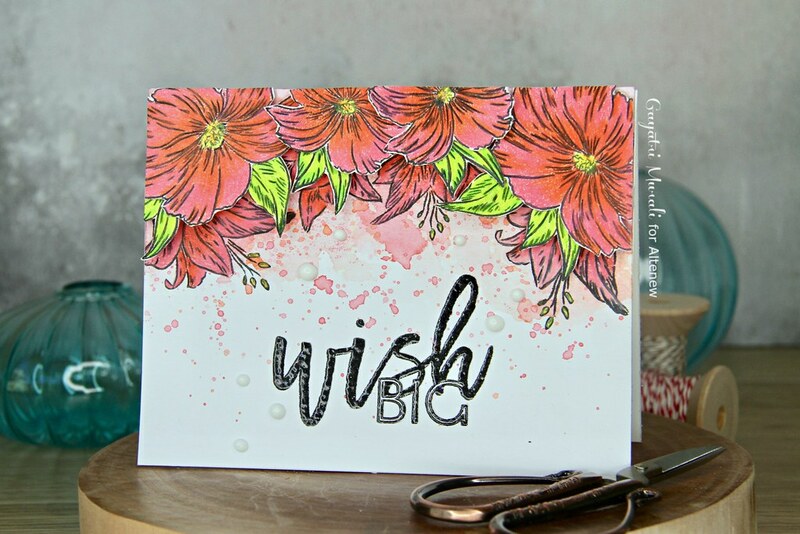 I used the new Happy Heart stamp set, coordinating die and Wish Big mini stamp set to make this card. I love the artistic look of this card. And here is how I made this card. 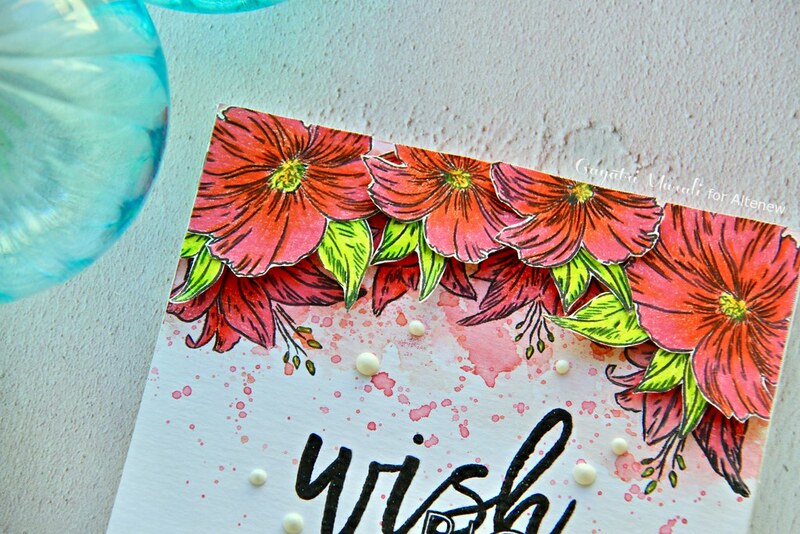 I started with stamping the flowers and leaves on a white cardstock using Altenew Permanent black ink. Then I coloured the images using Prisma Colour pencils. Yes they are coloured using pencils because I had another plan in my mind when I started this project. After colouring the images, I hand cut the images out. There are coordinating dies but I did not want the white border around. This is when my plans changed. I had a distress ink smooshed watercolour background card on my desk. The colours coordinated so well with the coloured images. So I decided to use the panel. The watercolour panel was smooshed with Ripe Persimmon, Worn Liptstick and Tattered Rose distress inks. I wanted layers. So I stamped the same images from Happy Heart stamp set on the panel using Altenew Permanent Black Ink on top of the watercolour smooshed panel. I coloured these images using the same Prisma colour pencils I used previously. I overlaid this layer with the hand cut coloured images made earlier using foam adhesive. This gives dimension. I trimmed off the over hang on the top of the panel. For the sentiment, I black heat embossed the sentiment Wish Big from Wish Big stamp on the middle towards the bottom of the panel. I adhered this completed panel to the card base and embellished the card front with white nuvo crystal drops. 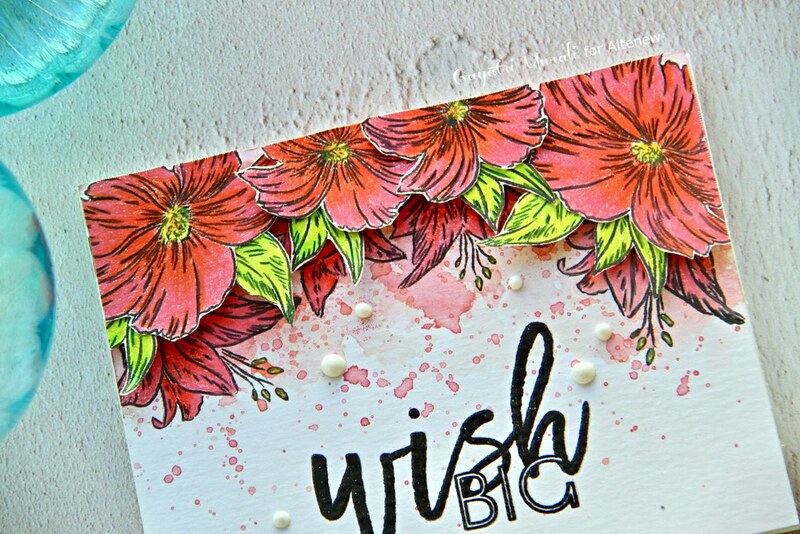 I love the smooshed watercolour background with hard and soft edges and spatters. This gives artistic feel to the card. Layering the cut images over the stamped images gives dimension to the card. 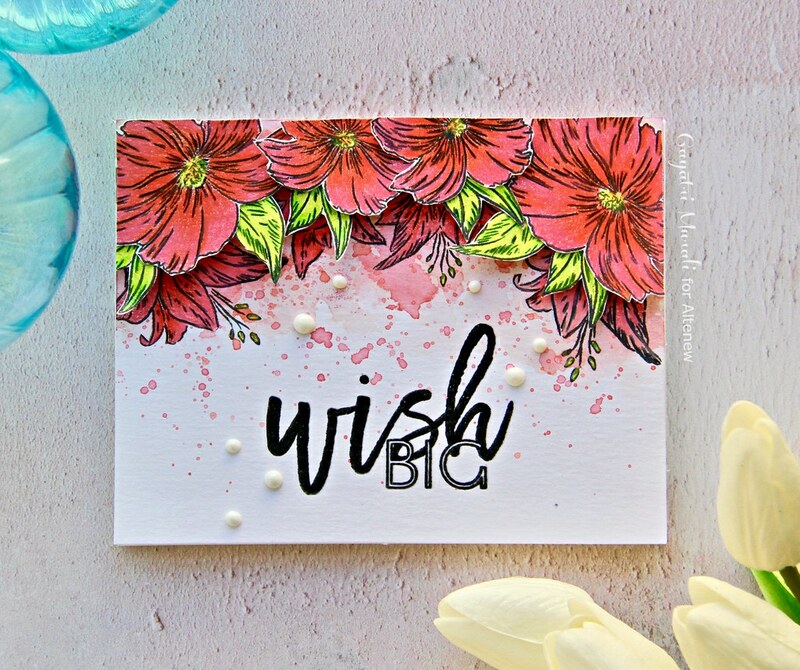 All the colours are neutralised with the big, bold and glossy heat embossed sentiment.All supplies used to make this card are listed below. These are affiliate links for which I get a small commission at no extra costs for you. Thanks for stopping by my blog today. Have a wonderful weekend.